The WTO Trade Facilitation Agreement (TFA) will improve trade efficiency worldwide, encouraging economic growth by cutting red tape at borders, increasing transparency and taking advantage of new technologies. The TFA has entered into force and is binding on all WTO members. Border inefficiencies, complex customs rules and other trade barriers make it harder for businesses of all sizes to trade internationally, hurting small and medium-sized companies (SMEs) the most. Research by the World Economic Forum suggests TFA implementation could trigger a 60% to 80% increase in cross-border SME sales in some economies. The implementation of the TFA would have a greater impact on international trade than the elimination of all the world’s remaining tariffs. It will reduce average trade costs by up to 15% with developing countries benefiting even more. The business community is widely recognised to have an important role to play in the implementation of the TFA, ensuring that TFA reforms deliver measurable improvements in trading across borders. 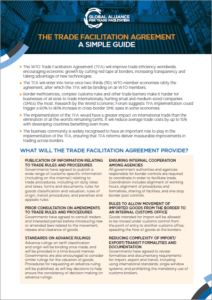 WHAT WILL THE TRADE FACILITATION AGREEMENT PROVIDE? Governments have agreed to publish a wide range of customs-specific information (including on the internet) relating to trade procedures, including on duty rates and taxes, forms and documents, rules for goods classification and valuation, rules of origin, transit procedures, and penalties and appeals rules. Governments have agreed to consult traders and interested parties before introducing new or amended laws related to the movement, release and clearance of goods. Advance rulings on tariff classification and origin will be binding once made, and will be provided in a time-bound manner. Governments are also encouraged to consider similar rulings for the valuation of goods. Procedures for requesting an advance ruling will be published, as will key decisions to help ensure the consistency of decision-making on advance rulings. All government authorities and agencies responsible for border controls are required to coordinate in order to facilitate trade. Coordination includes alignment of working hours, alignment of procedures and formalities, sharing of facilities, and one stop border post controls. Goods intended for import will be allowed to be moved under customs control from the point of entry to another customs office, speeding the flow of goods at the borders. Governments have agreed to review formalities and documentary requirements for import, export and transit, including using international standards, single window systems, and prohibiting the mandatory use of customs brokers. Traders directly affected by a decision or omission by customs are to receive an explanation of reasons, and will have the right to appeal the decision. Governments will publish notifications relating to procedures on the control of foods, beverages or feedstuffs at the border crossing, including offering the possibility of a second opinion when consignments are deemed unsafe. Fees and charges relating to imports and exports will be limited to the approximate costs of the services rendered. Any penalties for breach of laws or regulations will be proportional to the breach, and the collection and assessment of penalties and duties will be guarded against conflicts of interest. Customs procedures for the release and clearance of goods for import, export or transit will be standardized and improved. This includes commitments to maximize technology use, simplify rules as appropriate for authorized traders, publish release times, and encourage risk management and auditbased control in the inspection of cargo. Governments are encouraged to improve transit of goods to other countries, including providing dedicated transit lanes, minimizing transit documentation requirements, and allowing advance filing for processing of documents. Governments are to share information when customs requests information from another customs authority, particularly relating to verification of import or export declarations. Development of voluntary compliance systems allowing self-correction by business without penalty is encouraged. Each government is required to form or maintain a National Committee for Trade Facilitation in order to coordinate the implementation of the agreement. Most governments are consulting with both public stakeholders and the business community as they prepare for the implementation of trade facilitation reforms. The WTO will have a permanent forum known as the Committee on Trade Facilitation. The TFA provides for staged implementation for developing and least developed economies, allowing longer periods for compliance depending on need. Affected economies will also be able to link commitments to the receipt of technical assistance and capacity-building support, as monitored by the WTO.